Village Names in Baptismal Records at San Gabriel, San Fernando Missions From Engelhardt, 1927. Treaty Between the United States and the Indians of "Castaic, Tejon, Etc." (Unratified), 1852. Ethnography of Castaic by Jerry Reynolds • The Signal, n.d.
Human Remains Encountered During Construction: Hydraulic Research, Valencia, 1968 • News reports. L.A.-Kern Recycled Water Project EIR (2008): Paleontology, Tataviam & Kitanemuk Prehistory, AV History. 2008. Investigation of Damage to Paradise Ranch Knoll Earth Oven, Castaic Area • ANF 2009. LW0311 - Tataviam-Vanyume Reburial at Anaverde Development, Palmdale, 3-11-2006 (28 Views). Phase I Archaeological Investigation, Castaic High School Site. Romani 2010. Developer Donates Thousands of Artifacts to Museum in Newhall by Leon Worden, November 2007. Riverpark by Newhall Land: Draft Environmental Impact Report, Cultural Resources Section. Impact Sciences, February 2004. A Social and Political History of the Fernandeño Tataviam Band of Mission Indians FTBMI 2009. Fernandeño-Tataviam Band of Mission Indians: Three Lineages and Their Leaders FTBMI 2016. Territory and Brief Ethnohistory of the Fernandeño Tataviam Band of Mission Indians FTBMI 2016. SCV Newsmaker: Rudy Ortega Jr., Chairman, FTBMI SCVTV 4-30-2017. Purpose of Fort Tejon & San Sebastian Indian Reservation • From Wilke & Lawton 1976. Legend of Indian Massacre at Castaic Lake, Lebec • News Report, 1927. The Mojave River and the Central Mojave Desert: Native Settlement, Travel and Exchange in the 18th and 19th Centuries • David D. Earle, 2005. Coso Obsidian Economic Exchange System, Western Mojave Desert • Mark R. Faull, 2006. LW2162 - Bering Strait / Arrival of Early Man. 3 Oversized Images. 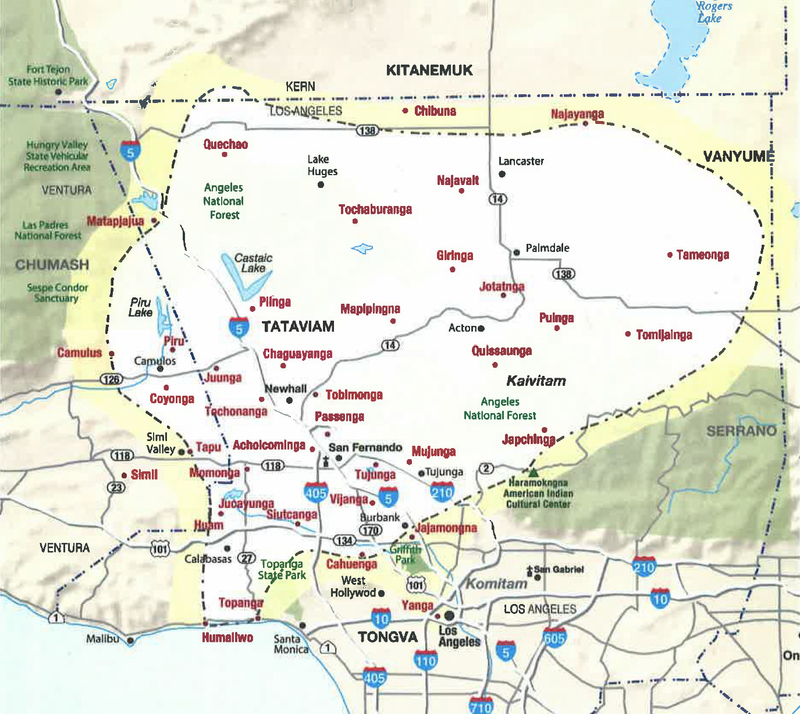 JJ2001 - Linguistic Map: Chumash-Gabrielino-Tataviam-Kitanemuk. JJ2002 - Map: Major Language Groups of California. LW3077 - Kitanemuk Mythology: Coyote Kidnaps Mountain Lion's Sons • Zigmond 1980. JJ1006 - Indians at Mission San Fernando: Drawing by Vischer, 1865. JJ1007 - Mission San Fernando: Woodcut. JJ1009a - Indians at Tejon: Woodcut, 1853. LO8801 - Church at Ex-Sebastian Indian Reservation, 1888-1900. LO8802 - Indian Home and Orchard, Tejon Ranch, 1888-1900. LO8804 - Unidentified Indian Man, Woman, Child with Dog in Front of Giant Oak Tree, Tejon Ranch 1888. LW2855 - USGS Map: Buena Vista Lake Quadrangle, August 1912. LW3090 - (Funeral for) Santos Juncos, Last of the Original San Gabriel Mission Indians, 2 Images, 2-11-1921. LW3043 - Two Indians Huddle for Warmth, Inyo County, 1930s. PB65763 - Tejon Indian Basketry Bowl, Photo 1985. PB64811 - Tejon Indian Shallow Basketry Bowl, Western Mono?, Photo 1985. LW2807 - Coiled Basket from Tejon (1875) in Ramona Museum, San Gabriel. LW2808 - Southern California Coiled Basket in Ramona Museum, San Gabriel. JJ1005 - Gabrielino Indian Women at Mission San Fernando, c. 1900. Cultural Resources Assessment: Verizon Facility, Mt. Baldy (Tongva, Serrano, Vanyume) 3-26-2014. LW2837 - CA-INY-272: Swansea Petroglyphs (Solar Observatory? ), Owens Valley, 3-27-2-16 (60 Views). LW2838 - Bedrock Mortars, Independence, Owens Valley, 3-26-2016 (11 Views). LW3257 - Photo Gallery: Largest Ancient Chumash Basket Ever Found (SBMNH 2015). INDEX - Photos of Bowers Cave Artifacts at Peabody Museum, Harvard University. Multiple Images. Rev. Stephen Bowers on Bowers Cave & Artifacts Pacific Science Monthly 1885. Perforated Stones from Bowers Cave by Henry W. Henshaw, 1887 (Excerpt). AP0812 - Bowers Cave, ca. 1951. 4 Images. Map - Bowers Cave, Pyle Ranch, Indian Tribes. Desert Magazine, January 1952. Archaeology & Inventory of Bowers Cave - Elsasser & Heizer, 1963. JJ2003 - Diseño Map: Rancho San Francisco (SCV). JJ2004 - Indian Village Map: Santa Clarita Valley & Environs. JJ2005 - Tataviam Village Site Map - Santa Clarita Valley. AP0225 - Van Valkenburgh Map of Indian Villages in the SCV, 1937. JJ1008 - Tataviam Village Site at Piru. RW0100 - Arrow Straightener. Found ca. 1984. LW9550 - Vasquez Rock Art: Sun. Color Photo, 1995. LW9551 - Vasquez Rock Art: Lizard & Rattlesnake. Color Photo, 1995. LW9552 - Vasquez Rock Art: Volcano. Color Photo, 1995. LW9553 - Vasquez Rock Art: Snake. Color Photo, 1995. LW9555 - Vasquez Rock Art: White Dotted Figure. Color Photo, 1995. LW9556 - Vasquez Rock Art: Lizard. Color Photo, 1995. LW9557 - Vasquez Rock Art: Black Figures. Color Photo, 1995. LW9558 - Vasquez Rock Art: Red Figure. Color Photo, 1995. LW0070 - Fish Canyon Bedrock Mortars & Cupules (2 Views). LW0071 - Fish Canyon Rock Shelter. LW2066 - Tataviam Wooden Bowl. Color. LW3494 - Tataviam Twined Basketry Fragment from Piru Creek, NHMLA Collection. MS0009 - 2 Steatite Bowls Unearthed at Hydraulic Research Site, Valencia, October 1968. LW2597 - Tataviam Ceremonial Bar, 1970 Elderberry Canyon Dig, 4 Views. LW2598 - Tataviam Blue Steatite Cup, 1970 Elderberry Canyon Dig, 5 Views. LW2599 - Tataviam Projectile Points (4), 1970 Elderberry Canyon Dig. LW9554 - Kitchen Setting (Re-creation), 1995. MD1401 - Projectile Point, Found in Haskell Canyon 2-16-2014. LW2632a - Grinding Stones in ex-Rubel Museum in Del Valle Winery at Rancho Camulos, 2 Views, 6-28-2014. TV1703 - Tataviam Mortar and Pestle, Rancho Camulos Museum Collection, On Loan to Smithsonian Institution, Multiple Views 2-17-2017. LW3120 - 2 Mortars, 2 Pestles, Discovered in Bouquet Canyon, 1920s-1930s. BLR0000 - Lithic Material from Blum Ranch (Mult. ), Aliso Canyon, Acton, Collected 1891-2017. LW3189 - Small Bedrock Mortar, Little Rock Creek. Photographed 2-24-2018. LW3268 - Coiled Tataviam Basketry Fragment from Vasquez Rocks, Likely Pre-Contact. Rare. Photographed 4-23-2018. LW3302 - Burham Canyon Pictographs: Kitanemuk, Tataviam, Kawaiisu Birthing Cave. Photographed 6-3-2018. SW.SCV1801 - Pestle, Found in Newhall, June 2018. The Purisma Rebellion, in Cook, S.F. : Expeditions to the Interior of Central California, 1820-1840 (1962). LW2555 - Antelope Valley Indian Museum Building, 7 Views, 12-28-2013. 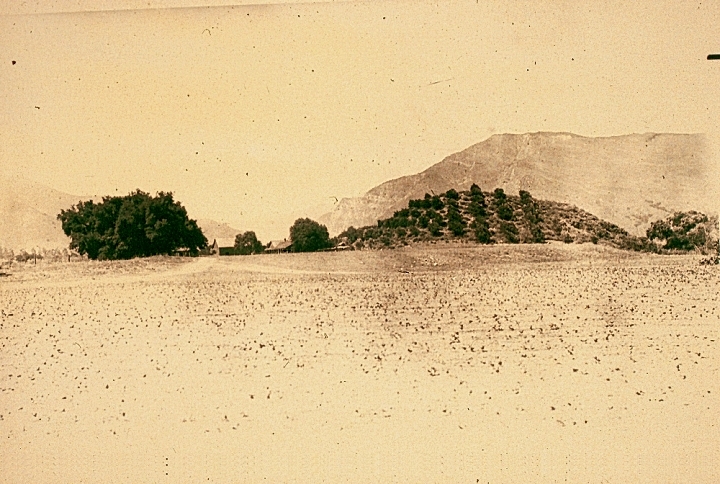 Piute Butte: A Preservation Planning Study by Edra Moore, SCA Proceedings 2009. CA-LAN-192: Lovejoy Springs and Western Mojave Desert Prehistory - L.A. County Public Works, March 2009. HB1401 - Anthropomorphic Rock Feature (Female Fertility), Piute Butte, 4 Views, 7-26-2014. Aboriginal Art in Obsidian (Stockton Curves, Points) by H.C. Meredith, The Land of Sunshine, October 1899. Mound Excavations Near Stockton (Curves, Clay Balls, etc.) by Philip Mills Jones, UCLA 1923. Yuki Basketry by Isabel T. Kelly, UC Press, Berkeley 1930. Culture Element Distribution: XIX, Central California Coast by John P. Harrington, UCLA 1942. Village Names in Twelve California Mission Records by C. Hart Merriam, UCB July 1968. 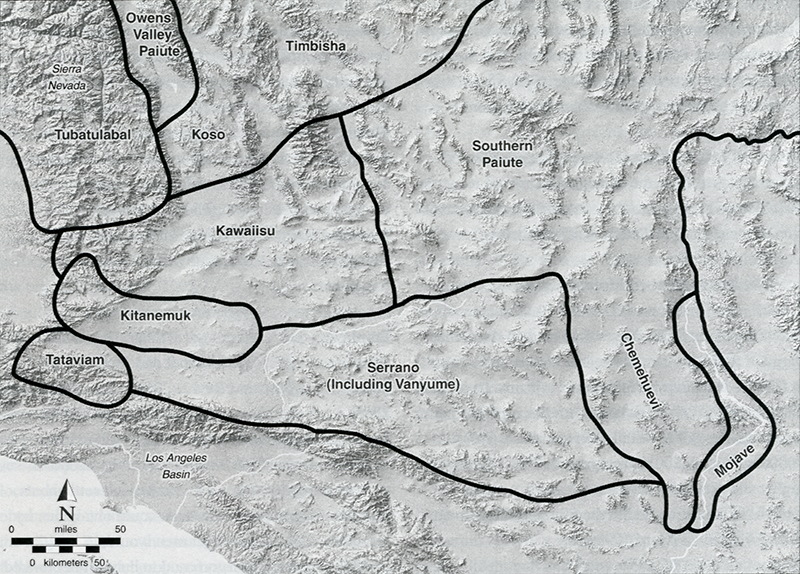 Overview of Cultural Resources of Western Mojave Desert • Stickel & Weinman-Roberts 1980. Little Lake Site, Pinto Points, Obsidian Dating in Great Basin by Clement W. Meighan, 1981. Kawaiisu of South-Central California: Creating a New Identity • Zaglauer 1995. Local Ethnobotany: TEA21 Rural Roadside Inventory, Caltrans District 7 • Fortier 2008. Charcoal Identification of Rowher Flat Earth Ovens, 6000-2400 B.C. • Puseman & Logan 2009. Prehistoric Ceramics of the Southern California Coast by Jennifer L. McElhoes, 2017. California Indian Indenture/Slavery Act, Adopted 1850, Expanded 1860, Repealed 1863. 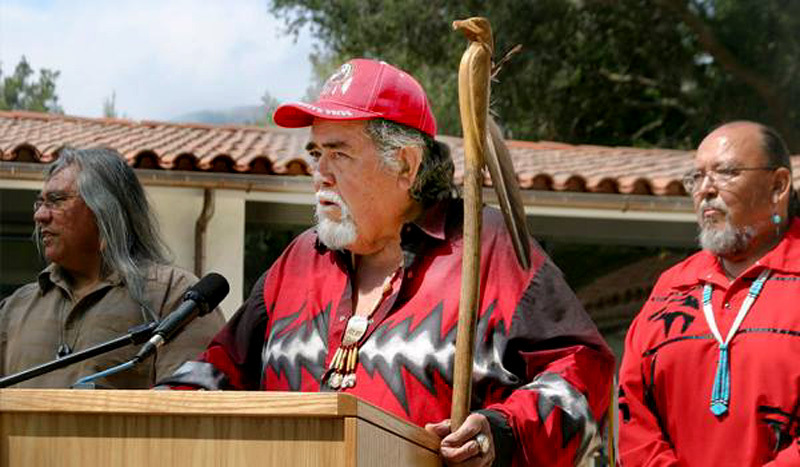 | California Native American Graves Protection and Repatriation Act of 2001. Native American Graves Protection and Repatriation Act (NAGPRA), Enacted 11-16-1990. University of California Policies & Procedures on Treatment of Native American Remains and Artifacts, Report 9-26-2018. Notice of Inventory Completion: U.S. Department of the Navy (San Nicolas Island), Federal Register 11-19-2018. Tejon Indian Tribe Request for Confirmation of Status, 6-30-2006. Reaffirmation of Federal Recognition of Tejon Indian Tribe, 4-24-2012. Federal Register: Notice to Prepare EIS for Tejon Indian Tribe's Proposed Casino Project, 8-13-2015. The information below is incomplete. All family subgroups within the Tataviam sphere will be included. This is a work in perpetual progress. New records are added each week. Descendants may submit records and information here. OR patriarch/matriarch or spokesperson for a particular family subgroup. From left: Dennis Garcia, *Charlie Cooke, Ted A. Garcia. Descendants of persons who lived in the Santa Clarita Valley and environs prior to European contact in 1769. (Leading numbers denote generations, not relationships.) Spanish Name followed by Native Name. Baptismal Data: Zenona Purichi (SFR-B01917), 4-1-1811 (age 60). Baptismal Data: Amando Tuuyachs (SFR-B00706), 12-11-1802 (age 60). Death Record Data: Amando Tuuyachs (SFR-B00706), 5-12-1823. Baptismal Data: Daniel (SFR-B00304), 11-9-1800 (age 50). Marriage Register Data: Daniel (SFR-B00304) and Bernardina (SFR-B00295), 11-9-1800(R). Death Record Data: Daniel (SFR-D00246), 8-25-1803. Baptismal Data: Bernardina (SFR-B00295), 9-28-1800 (age 45). Baptismal Data: Rafaela (SFR-B00720), 12-11-1802 (age 45). Death Record Data: Rafaela (SFR-B00720), 8-27-1814. Baptismal Data: Amanda (SFR-B00716), 12-11-1802 (age 40). Death Record Data: Amanda (SFR-B00716), 4-3-1816. Baptismal Data: Paulina Yupjuiban/Yucsuiban (SFR-B01916), 4-1-1811 (age 38). Baptismal Data: Cornelio (SFR-B00765), 1-8-1803 (age 25). Baptismal Data: Maria Rosa Papumchuquina (SFR-B00072), 2-16-1798 (age 17). Baptismal Data: Antonia (SFR-B00717), 12-11-1802 (age 18). Baptismal Data: Ysabel Ritmuia (SFR-B00056), 12-25-1797 (age 12). b. ~1793 in Tujunga after his mother Bernardina of Quissaubit (SFR-B00295) moved there; married Teofila of Topipabit (SFR-B01848), widowed; married Sista (SFR-B01754), widowed; presumed dead August 1829. Baptismal Data: Francisco del Espiritu Santo (SFR-B00171), 5-12-1799 (age 5-6). Marriage Register Data: Francisco del Espiritu Santo (SFR-B00171) and Teofila Gigiuco (SFR-B01848), 6-27-1811. Marriage Register Data: Francisco del Espiritu Santo (SFR-B00171) and Sista (SFR-B01754), 12-4-1821. Death Record Data: Francisco del Espiritu Santo (SFR-D01883), August 1829.
b. ~1799 (per baptismal data) at Topipabit Village (Victorville); daughter of Paulina Yupjuiban/Yucsuiban and Taari; married Francisco del Espiritu Santo; d. 12-9-1819. Baptismal Data: Teofila Gigiuco (SFR-B01848), 3-31-1811 (age 12). Death Record Data: Teofila Gigiuco (SFR-D01353), 12-9-1819.
b. 1809 at Mission San Fernando; daughter of Salvador and Salvadora; 2nd wife of Francisco del Espiritu Santo; d. 2-5-1828. Baptismal Data: Xixta (SFR-B01754), 8-6-1809 (newborn). Death Record Data: Sista (SFR-D01811), 2-5-1828. Baptismal Data: Genaro (SFR-B02039), 9-19-1812. *According to the Fernandeno-Tataviam Band of Mission Indians, Eugenia SFR-B02298 is Harrington's Kitanemuk informant Eugenia Mendez of Tejon. Baptismal Data: Eugenia (SFR-B02298), 9-13-1817. Marriage Register Data: Ramon (SFR-B01712) and Eugenia (SFR-B02298), 6-13-1832.
b. 1808 at San Fernando Mission; son of Antonia (SFR-B00717) and Cornelio (SFR-B00765); married Eugenia 6-13-1832; buried 6-2-1845. Baptismal Data: Ramon (SFR-B01712), 8-30-1808 (newborn). Death Record Data: Ramon (SFR-D02362), buried 6-2-1845.
b. 3-11-1825 at San Fernando Mission; son of Francisco del Espiritu Santo (SFR-B00171) and Sista (SFR-B01754); d. 6-14-1829. Baptismal Data: Francisco (SFR-B02598), 3-11-1825. Death Record Data: Francisco (SFR-D01873), 6-14-1829. Baptismal Data: Escolastica (SFR-B02806), 2-10-1834 (birth). Baptismal Data: Jacoba (SFR-B02846), 4-28-1835 (age 1d). Baptismal Data: Jesus Maria (SFR-B02927), 12-24-1837 (age 1d). Baptismal Data: Leandra (SFR-B02987), 3-28-1840 (age 2d). Baptismal Data: Thomasa de Aquino (SFR-B02075a), 3-7-1845 (age 1d). Santiago Garcia Adobe, Little Rock Creek ~1885. Settlement in the Little Rock Creek Watershed (Santiago Garcia Info) by David Earle, 1-8-2003. LW3190 - Ysidoro Garcia's Land Patent, Castaic, 1891. Marriage License of Petra & Pete, 1899 • Shows how Ysidoro spelled/signed his name. Daughter of Catalina Leyvas/Leiva and Santiago Garcia; married Maria Antonio Ortega; ancestor of Rudy Ortega Sr. and Rudy Ortega Jr. Marriage Certificate: Dolores Cook & Francisca (Francis) Olme, Los Angeles, 4-30-1879. Francis Olme Cook at Cordova Ranch in Castaic, ~1886. Dolores Cook's Widow Swindled Out of Castaic Land by W.W. Jenkins Los Angeles Herald, 5-17-1901. Francis Olme Cook: Death Certificate and Obituary, 1931. Brother of Francis Olme; presumably son of Florida Parker/Parra and Antonio Olme. Joseph Olme at Cordova Ranch in Castaic ~1886. b. 1870; d. 1930; buried in Ruiz-Perea Cemetery. 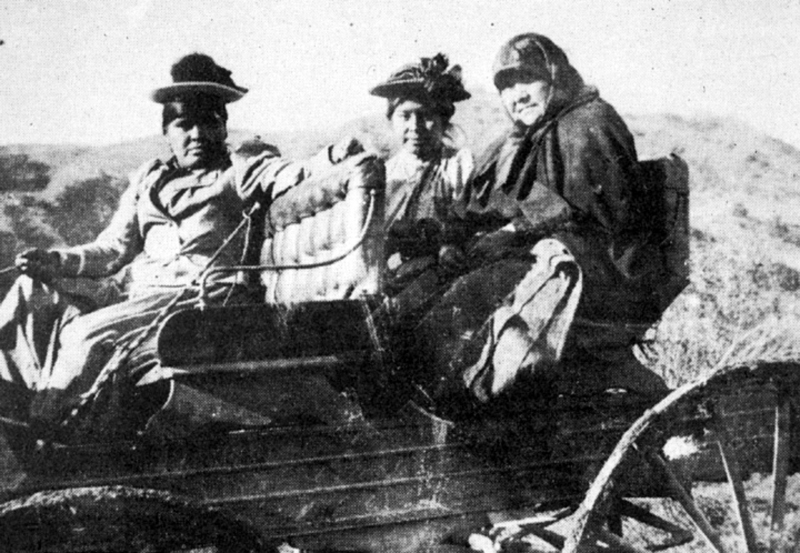 Dolores Cook at Cordova Ranch in Castaic ~1886. Eyewitness testimony to murder of Dolores Cook and George W. Walton Los Angeles Herald, 3-2-1890. LW3396 - 160-Acre Land Patent Issued Posthumously to Dolores Cook, 4-2-1891. Castaic Range War: Jenkins-Chormicle Feud Revisited by Dr. Alan Pollack, Heritage Junction Dispatch, Sept.-Oct. 2014. Brothers Fred and Theodore Cook[e] at Cordova Ranch in Castaic ~1886. *Frances & Fred Cooke, 2 Views, n.d.
*Frances Garcia Cooke's Death Certificate, 1946. *Frances & Fred Cooke's Grave Marker, Ruiz-Perea Cemetery, 7-14-2013. *Frances & Fred Cooke's Descendants Gather at Ruiz-Perea Cemetery, March 2001.
b. 1-16-1890 in Los Angeles County; daughter of Francis Olme and (Mr.) Dolores Cook (per Francis obituary); married Valentine Biscailuz (1893-1946) in 1917; d. 3-30-1922. Dolores Cook & Valentine Biscailuz: Marriage License & Certificate 1917. Mrs. Dolores Cook Biscailuz: Death Certificate 1922. Marriage License, Petra Garcia & Joseph "Pete" Rivera 1899. Joseph Pedro "Pete" Rivera: Death Certificate 1928. Wm. Chormicle Sued for Slander on Behalf of Mary Cooke, Age 8 • News Reports, September 1910. Marriage License & Cert. : *Mary Cooke and Louis Garcia, 1919. *Mary Cooke Garcia, Son Louis F. Garcia, GD Hearaldine Romero, Pacoima, ~1951. *Mary Cooke Garcia & Louis Garcia (Sr.), Pacoima, ~1951. *Mary Cooke & Louis Garcia. *Mary Cooke Garcia, GD Geraldine Romero Perez, GGS David Casarez Jr., Sea World, July 1973. Espidon Garcia Family in 1900 U.S. Census. Louis Gonzalez Garcia: WWI and WWII Draft Registration Cards. Marriage License & Cert. : Della F. Cooke and Rudolph N. Rodriguez, 1917. Cy Cooke, William S. Hart, Newhall Cowboys Place Marker at Ruiz Cemetery After Deadly Dam Break, 3-1928. Joseph Francis Cooke, Son of Fred & *Frances Cooke n.d.
Joseph Francis Cooke: Memorial Service Program, 3-3-1990. Bennie B. Cooke: Memorial Service Program, 1-31-1980. Marriage License & Cert. : Margaret S. Rivera (Garcia) and Eldridge A. Ward, 1914. Death Certificate for Margaret Sylvia Ward, nee Rivera, aka Garcia, 1899-1975. *Charlie Cooke's Family Tree by Mary Gordon, 2013. Daughter of Simon Dolores "Cy" Cooke and Meta Katherine "Katie" Rouff; married (Padilla); d.
Ernest "Ernie" Cooke, Hart High School Bus Driver, Late 1950s. Ernest & Edna Cooke, 2 Views, n.d.
Notes: Ruby is a cousin of Harold E. "Sonny" Romero, who married Ted's sister Mary Louise Garcia. Ted sometimes appears here (incorrectly) as "Ted Garcia Sr."
Garcia-Romero Family Outing, Pacoima, ~1950. Ted C. & Ruby Garcia, Hansen Dam Park, Pacoima, ~1951. Siblings Ted, Caroline & Dolores Garcia, Panorama City, ~1997. Louis F. and Mary Padilla Garcia, Daughter Alice, January 1962. Birth Certificate, Caroline Francis Garcia 1923. Caroline Francis Garcia, Portrait, ~Early 1940s. b. 1-10-1926 in Newhall; daughter of *Mary Cooke and 8)Louis Garcia; married Guerrero; d. 7-11-1999 or 9-27-1999? Mary Garcia Romero & Daughters Ernestine, Eleanor, Geraldine, ~1967. Mary Louise & Harold Romero Family Outing, ~1983. Katherine Garcia and Niece Frances Garcia in Tree, Pacoima, ~1949. Marriage Certificate: John Amos Ward (I) & Dorothy M. Wilson, 9-18-1939. Ward Family: John, Eleanor, Kenneth, n.d. (1940s). John Amos Ward's Military Service Record, 1944-1945.
b. 1-28-1915; son of Margaret Sylvia Rivera/Riveria (Garcia) and Eldridge Amos Ward (I); married Connie Morono; d. 1944 (cancer). 10) Daniel Bernard Martinez Jr.
Actinolite Canoe Carving by *Ted A. Garcia (2012), at Natural History Museum, 4 Views, Photos 11-23-2013. Steatite Turtle Carving by *Ted A. Garcia (~2012), 5 Views. *Ted A. Garcia Conducts Blessing at Hart Park (Newhall) Powwow, 9-28-2014. *Ted A. Garcia, Mike Cooke, Dennis Garcia at Hart Park (Newhall) Powwow, 9-28-2014. Dennis Garcia Presents, Dances at Hart Park (Newhall) Powwow, 6 Views, 9-27-2014. 10) Robert Joseph "Bobby" Ward Sr.
Robert Joseph Ward Sr., 1939-2011, Grave Marker. Juanita Marie Lopez (Villa), Portrait, ~1960. Frances Arlene Lopez (Burden), Portrait, ~1960. Ernestine (Tina) Cooke, Newhall Fourth of July Parade, ~1946. Ernestine (Tina) Cooke, Newhall School, Mid-Late 1940s. Sisters Ernestine, Susan & Belen Cooke in Snow on Ridge Route, 1951-1952. Ernestine (Tina) Cooke and Children, Newhall, Early 1980s. b. 3-14-1946; daughter of Mary Louise Garcia and Harold E. "Sonny" Romero; d. 2-28-2009; childless. Siblings Eleanor, Ernestine & Geraldine Romero, Pacoima, ~1955. b. 1947; daughter of Mary Louise Garcia and Harold E. "Sonny" Romero; childless. Siblings Ernestine & Augustus Romero, Sun Valley, ~1969. John Romero, Dannette Casarez, Geraldine Romero Perez, Michael Cooke, Rusty Cooke at Hart of the West Powwow, Newhall, 3 Views, 9-28-2014. Leticia Marie Thomas in Newhall Christmas Storybook Parade, 12-8-1973. Children of 10) Robert Joseph Ward Sr.
11) Robert Joseph "Bobby" Ward Jr.
Bobby Ward Jr., Soft Drink Salesman, Slain in Supermarket Robbery, Incident 10-19-1992. Children of 11) Robert Joseph Ward Jr.
Children of 11) Johnny Amos Ward Jr.
b. 1-8-2003; son of Tamara Lyn Ward and William Scott Tulowitzky Sr.
12) Manuel J. Lopez Jr.
Children of 12) Manuel J. Lopez Jr.
Child of 12)Manuel J. Lopez Jr. Daughter of 12)Manuel J. Lopez Jr.
9. Source: Rudy Ortega Jr.
Sinforosa Fustero (at right) ~1910. Baptismal Data: Georgio Jayinat (SFR-B01240), 3-3-1804 (age 38). Baptismal Data: *Jose Maria Seuyeuyeminasu (SFR-B00223), 12-8-1799 (adult). Baptismal Data: Tomasa Teuteu (SFR-B00229), 1-6-1800 (age 34). 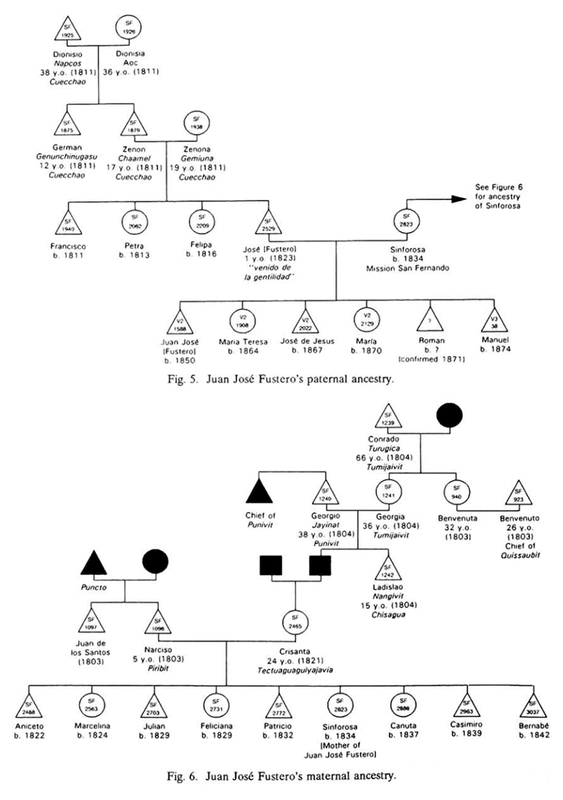 Juan Jose Fustero's ancestry, by Johnson & Earle (1990). Click image to enlarge. Baptismal Data: Dionisio Napcos (SFR-B01925), 4-9-1811 (age 38). Baptismal Data: Dionisia Aoc (SFR-B01926), 4-9-1811 (age 36). Baptismal Data: Crisanta (SFR-B02465), 10-25-1821 (age 24). Marriage Register Data: Narciso (SFR-B01096) and Crisanta (SFR-B02465), 12-4-1821. Baptismal Data: Narciso (SFR-B01096), 10-30-1803 (age 5). Baptismal Data: Juan de los Santos (SFR-B01097), 10-30-1803 (age 2). Baptismal Data: Zenona Getriuna (SFR-B01938), 4-9-1811 (age 19). Baptismal Data: Zenon Chaamel (SFR-B01879), 4-1-1811 (age 17). Baptismal Data: Eudoxia (SFR-B00152), 1-23-1799 (age 9). Baptismal Data: Eusebio Mu (SFR-B00149), 1-23-1799 (age 6). Baptismal Data: Estanislao Cabuti (SFR-B00150), 1-23-1799 (age 3). 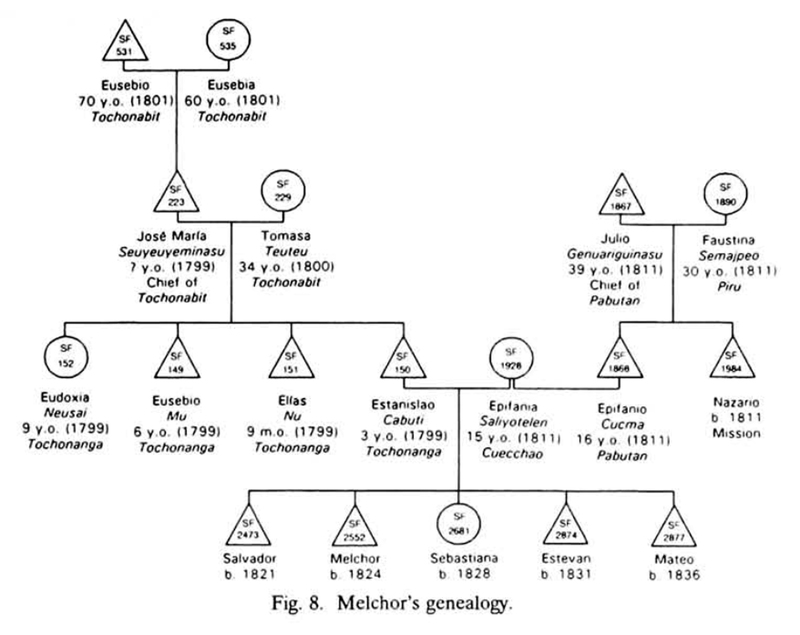 Melchor's genealogy, by Johnson & Earle (1990). Click image to enlarge. Baptismal Data: Elias Nu (SFR-B00151), 1-23-1799 (age 8 mos.). Baptismal Data: Epifania Saliyolelen (SFR-B01928), 4-9-1811 (age 15). b. ~1799 at Cuecchao, aka Kwitsa'o (Tataviam village in La Liebre area); son of Dionisia Aoc and Dionisio Napcos, m. Olegaria of Camulos; d. no later than 1824. Baptismal Data: German Genunchinugasu (SFR-B01875), 4-1-1811 (age 12). Marriage Register Data: German/Genunchinugasu (SFR-B01875) and Olegaria (SFR-B00905), 1-16-1813. Death Record Data: German/Genunchinugasu (SFR-D1609), <1824. Baptismal Data: Olegaria (SFR-B00905), 2-14-1803 (age 1). Death Record Data: Olegaria (SFR-D01348), 11-12-1819. Baptismal Data: Sinforosa (SFR-B02823), 7-18-1834 (age 1d). Sinforosa Fustero and Family, ~1910. Sinforosa Fustero, Newhall's Tataviam Basket Maker by David Desmond • October 2000. See "La Soledad" on this Diseno Map (Enlarge to View) ~1843. Juan Jose Fustero on Horseback. Juan Jose Fustero and Family. Juan Jose Fustero: Death Certificate 6-30-1921. 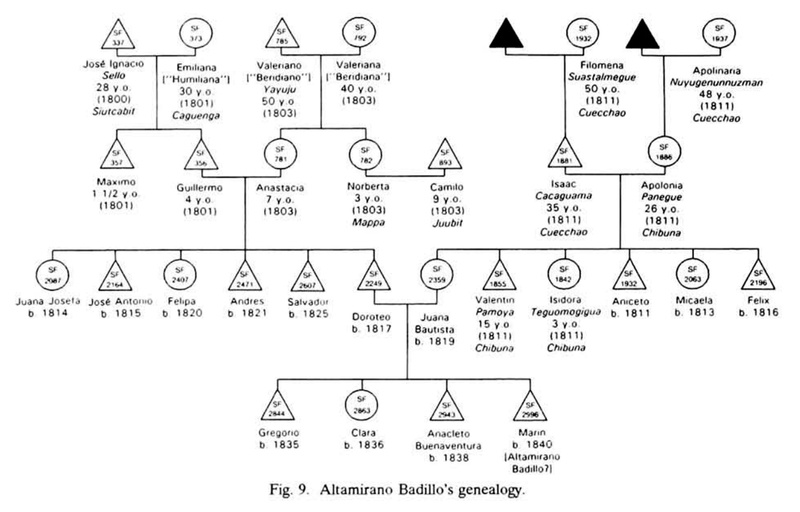 Altamirano Badillo's ancestry, by Johnson & Earle (1990). Click image to enlarge. Altamirano Badillo (1840-ca. 1913) was of partial Tataviam ancestry. He was probably born in the lower Piru Creek area and spent his childhood at Camulos. His mother's father, as well as his mother's mother's mother, were from Cuecchao (kwitsa'o), a Tataviam village in the Liebre Mountains — same as Juan Jose Fustero's paternal grandparents. (Leading numbers denote generations, not relationships.) Spanish Name followed by Native Name. * Probably born at Piru; was living at Tejon in 1905. Historical Tribal Territory, Fernandeño Tataviam Band of Mission Indians, 2016. Individuals whose place of origin is identified in mission records as Chaguayabit (aka Chaguayanga, Tsawayung), a Tataviam village at the confluence of Castaic Creek and the Santa Clara River (aka Castaic Junction). Spanish Name followed by Native Name. 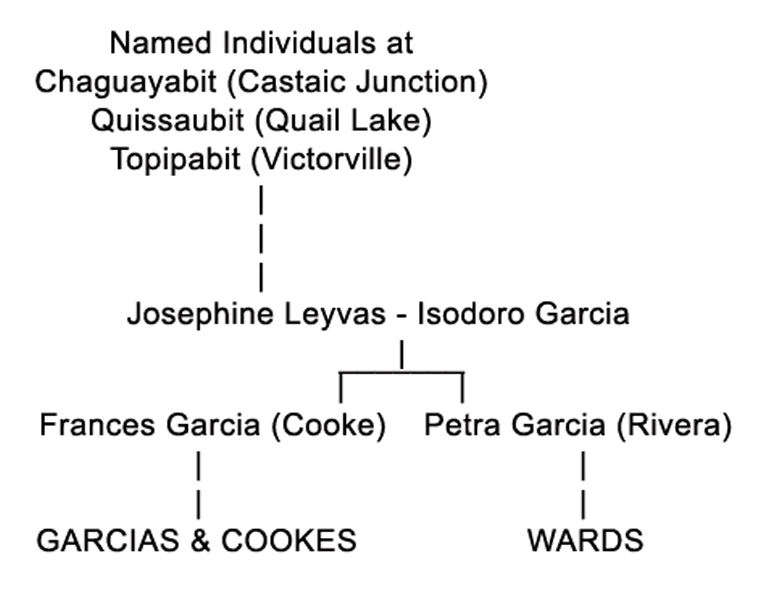 CGW = Persons also included above in the Cooke-Garcia-Ward families. (X) Generation. FUS = Persons also include above in the Fustero ancestry. (X) Generation. Baptismal Data: Alberto Chipobit (SFR-B00705), 12-11-1802 (age 50). Baptismal Data: Chrisogono Manuel (SG-B02451), 5-16-1794 (age 28). Baptismal Data: Canuta (SFR-B00721), 12-11-1802 (age 36). Baptismal Data: Maria del Carmen (SFR-B00622), 5-6-1802 (age 30). Marriage Register Data: Guido (SFR-B00915) and Maria del Carmen (SFR-B00622), 8-31-1828. Individuals whose place of origin is identified in mission records as Tochonanga (aka Tochonàbit), a Tataviam village somewhere in the vicinity of (later) Newhall. Its exact location is unknown. 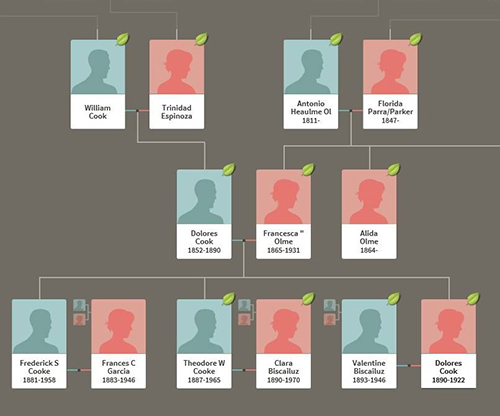 FUS or MEL = Persons also include above in the Fustero or Melchor ancestry. (X) Generation. b. ~1757 at Tochonabit (Tochonanga, Newhall); killed ~October 1799. Baptismal Data: Benjamin Joseph (SG-B01988), 2-2-1791 (age 34). Death Record Data: Benjamin Jose (SFR-D00036), d. ~October 1799. Baptismal Data: Hipolito de la Assumpcion (SG-B01339), 8-22-1786 (age 8mos). Individuals whose place of origin is identified in mission records as Piibit (aka Pi'ing, Pinga, etc. ), a Tataviam village in Elderberry Canyon under what is now the Castaic Reservoir (Castaic Lake). Baptismal Data: *Primo/Leyva (SFR-B00703), 12-11-1802 (age 90). Baptismal Data: Romulo (SFR-B00704), 12-11-1802 (age 40). Site of Piribit. Click for more. Individuals whose place of origin is identified in mission records as Piribit (aka Pi'iruking), a Tataviam village in the Lower Piru Creek drainage, now under Lake Piru. b. ~1754 at Piirucbit; married Modesto, widowed; died 2-2-1823. Baptismal Data: Eugenia (SFR-B00612), 2-10-1802 (age 48). Death Record Data: Modesta (SFR-D01517), d. 2-2-1823.
b. ~1788 at Piiru; married Guida of Camulos (SFR-B00932) on 2-19-1803; 2nd marriage Maria del Carmen of Chaguayabit (SFR-B00622) on 8-31-1828. Baptismal Data: Guido (SFR-B00915), 2-19-1803 (age 15). Marriage Register Data: Guido (SFR-B00915) and Guida (SFR-B00932), 2-19-1803. Individuals whose place of origin is identified in mission records as Camulus or Caamulus or Coa(y)— (now known as Camulos), a Tataviam village in the Lower Piru Creek drainage. Baptismal Data: Rufina (SFR-B00959), 2-19-1803 (age 90). Baptismal Data: Arnaldo (SFR-B00916), 2-19-1803 (age 60). Baptismal Data: Arnalda (SFR-B00934), 2-19-1803 (age 60). Baptismal Data: *Pedro Jose Quiya (SFR-B01149), 1-28-1804 (age 34). Baptismal Data: Adeodato (SFR-B00917), 2-19-1803 (age 25). Baptismal Data: Maria Trinidad (SFR-B00948), 2-19-1803 (age 24). Marriage Register Data: Manuel Antonio (SFR-B01027) and Maria Trinidad (SFR-B00948), 3-25-1803. Baptismal Data: Adeodata (SFR-B00935), 2-19-1803 (age 20). Baptismal Data: Guida (SFR-B00932), 2-19-1803 (age 15). Death Record Data: Guida (SFR-D01757), d. 12-19-1827. 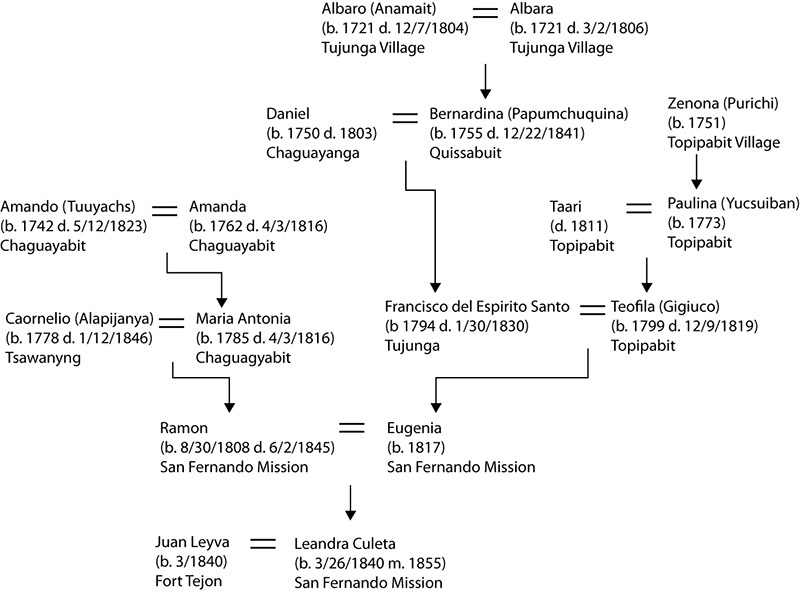 Individuals whose place of origin is identified in mission records as Cuecchao (aka Kwitsa'o), a Tataviam village in the La Liebre area, possibly the later Knapp Ranch. FUS or MEL = Persons also included above in the Fustero and Melchor ancestry. (X) Generation. Baptismal Data: Emeterio Alaguo (SFR-B01861), 4-1-1811 (age 40). FUS b. ~1799 at Cuecchao, aka Kwitsa'o (Tataviam village in La Liebre area); son of Dionisia Aoc and Dionisio Napcos, m. Olegaria of Camulos; d. no later than 1824. Individuals whose place of origin is identified in mission records as Pujaubit or Pujauvinga, a Tataviam village probably in the Newhall area. Chester King theorizes that it was closer than Chaguayabit was to Mission San Fernando. Baptismal Data: Modesto (SFR-B00572), 6-21-1801 (age 50). Baptismal Data: Anselmo (SFR-B00318), 12-14-1800 (age 14). Baptismal Data: Bernarda (SFR-B00510), 3-14-1801 (age 7). Marriage Register Data: Timoteo (SG-B02467) and Bernarda (SFR-B00510), 10-8-1810. Death Record Data: Bernarda (SG-D03069), buried 4-7-1811.
b. ~1797, son of Rufina (and Modesto?) of Pujaubit (SFR-00572), brother of Bernarda (SFR-B00510) and Anselmo (SFR-B00318); buried 2-22-1815. Baptismal Data: Fulgencio (SFR-B00507), 3-14-1801 (age 4). b. ~1781 at Tujunga; cousin of Anselmo of Pujaubit (SFR-B00318); buried 5-27-1803. Baptismal Data: Bartolome Namurbat (SFR-B00054), 12-25-1797 (age 16). b. ~1783 at Siutcabit (Encino, corner Ventura & Balboa); married Getruis (SFR-B01090), widowed; married the widow Josefa Vicenta (SFR-B00468) 1821 (m. SFR-M00700); buried 11-5-1835. Baptismal Data: Ynocencio (SFR-B00362), 1-4-1801 (age 18). b. ~1796, per death record: son of Eugenia (which one?) and Benjamin of San Gabriel Mission (which one? ); buried 11-19-1802. Baptismal Data: Venancio (SFR-B00589), 11-6-1801 (age 5). b. at Juyubit, a rancheria near San Gabriel Mission & River (per his marriage record with Mariana 1812); married Bernarda (SFR-B00510) 10-8-1810, widowed; married Mariana of Pabiambit (SG-B04551) 7-30-1812, widowed; married married Eustaquia Antonia of Guinibit (SG-B02607) 6-4-1816; d. 3-30-1820. Baptismal Data (Reconstructed): Timoteo (SG-B02467). Marriage Register Data: Timoteo (SG-B002467) and Bernarda (SFR-B00510), 10-8-1810. Marriage Register Data: Timoteo (SG-B002467) and Eustaquia (SG-B02607), 6-4-1816. Death Record Data: Timoteo (SG-D04262), s. 3-30-1820.